Join the discussion on our forums! Come discuss Spellweaver over in our dedicated Spellweaver discussion topic. There's no deck that would run this over Evolved Kobold... He's only used for the +2 spell power, which makes this way to costly for any OTK/combo decks. I mean it is not a horrible card. Just that its use is very specific in the late game. Like you could play this with Swipe in Druid which is very strong value. Just unfortunate that most likely it would be a dead card for majority of the game. This is actually pretty scary to see in a Ramp Druid deck. Imagine seeing this on turn 3 or 4 against a Druid ._. would not be too angry with this out of moon glade portal though! Spell damage is just too heavily weighted. It completely ruins a card's mana cost, attack and health. well, we should be careful with the spell damage. If bliizzard give even a little free space with that, bad things can happen. It's better this way. 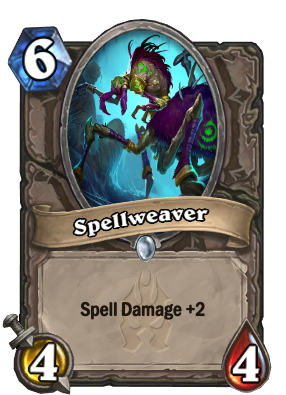 While that can be true, that ship has long sailed with Malygos being +3 mana to get +3 spell power and +8 health compared to this (And a dragon so you can draw him with the Curator) and Evolved Kobold being 2 mana less for basically the same effect. A 6 mana 4/4 is too weak to be expected to live for a turn (Which Malygos can do sometimes) and too costy to allow any OTKs (which Evolved Kobold would be much better suited for). I think if it was a 5/5, you wouldn't actually improve any OTKs, and it could perhaps be used as a body. If Evolved Kobold barely worked, a more expensive version of it won't. "Look son ! A pack filler !"